Santa Scamper t-shirt logo form many years ago. 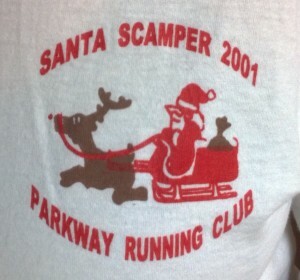 The Parkway Running Club (PRC) of West Roxbury, MA has hosted an annual Santa Scamper 5k road race since 1994. This race raised money for the Boston Globe Santa Fund, a charity to support children of need in Massachusetts. In 2004, PRC re-named the race Walter’s Run to honor a very special friend and member, Walter Burgess. Walter passed away suddenly in November 2003 at the age of 40 shortly after having completed the Great Floridian Ironman Triathlon. Walter was an active PRC member and an amazing athlete — forever working out either at the Y, on his bike, or running on the roads. More importantly, Walter was an incredible friend and inspiration. He was always there to run the slower members into the finish line, to organize the marathon long runs or group ski trip, to cheer others on, or to give us a big smile after a training run or race no matter the length. The Boston Globe Santa fund was one of Walter’s favorite charities that he donated to regularly, even as a child. To more fully demonstrate Walter’s love of community and running, we have expanded the organizations receiving proceeds from Walter’s Run to include the YMCA Reach Out Campaign and the Walter Burgess Scholarship Fund. We dedicate this race to Walter Burgess.